In November, I happened to come by an online poster from the University looking for interested students who are willing to participate in the Model International Civil Aviation Organization (ICAO) Forum that was going to be held in Shenzhen, China. ICAO is an agency of the United Nations (UN) specialising in civil aviation. Personally, outside of aviation, I’ve always been interested in activities that relate to discussions of a multitude of global issues; and I’ve always been following Model UN activities on social media. I felt reluctant to know that there was an international event dedicated to aviation. At that point of time, I had no hesitation in showing my interest for that once-in-a-lifetime opportunity. I believed that it was a great way to get myself up to speed with global aviation matters. The 2nd Model ICAO Forum was held between the 12th and 14th of December as a side event of the Next Generation of Aviation Professionals (NGAP) Global Summit. The main purpose of the event as a whole was to discuss on numerous issues with regards to civil aviation as well as looking at ways to encourage and train the next generation of aviation professionals who are eventually going to play an essential part in the industry’s growth in the years to come. 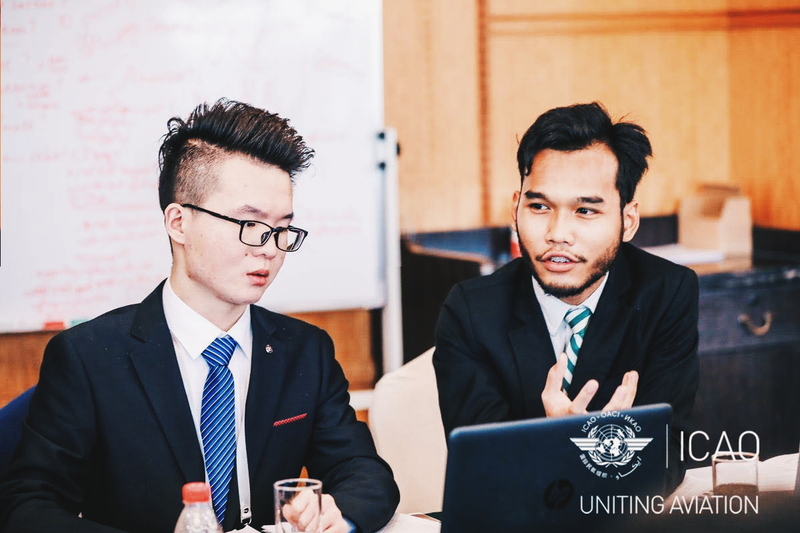 For the Model Forum specifically, it provides a platform for students to gain a deeper understanding of current global issues in aviation and in some aspects, diplomacy. In the previous year, the forum was held in ICAO’s headquarters in Montreal, Canada. I chose The Socio-Economic Benefits of Air Transport since generally, I was more familiar with the area as compared to the other three. After successful application, about 1-2 weeks before the event, I received the agenda for the 3 days, a guidebook, and lastly, a study package for my topic. Specifically for my topic, the package was slightly more than 50 pages long and consisted of a number of case studies and information which we had to acquaint ourselves with prior to the event itself. In the few days before my flight to Shenzhen, I had the chance to print out the study package, did a little reading and highlighted a number of important points and data from the package. It was a lot to digest within a small amount of time but it was manageable. My flight arrived in Shenzhen on the midnight of the first day of the event. A friend and I shared a taxi to get to our hotel located in the east part of the city. By the time we got everything settled down, it was already about 3am in the morning. After some sleep and breakfast, we boarded the bus at about 9am to the event location at a guesthouse located near the central area of the city. Before the event started at about 11, there was some time for a photo-taking opportunity at the entrance and so we didn’t miss that chance. This year, roughly 180 students from 27 universities in 28 different countries participated in the Model ICAO Forum. My university alone sent 16 people to participate in the activities. The first activity of the day was the official welcoming to the model forum. There were a few opening remarks made by important officials including Ms. Fang Liu, the Secretary General of ICAO, and Mr. Yao, the Secretary General of the Chinese Society of Aeronautics and Astronautics (CSSA). This was followed by a short introduction to the city of Shenzhen and a number of keynote speeches to get ourselves familiar with the context of the activities we were going to participate in. Afterwards, there was a brief on what we were going to be expected to do in the Model ICAO Forum itself along with the guidelines. We were also introduced to the stream/topic leaders who were going to guide us during the duration of the model forum itself. First panel discussion of the ICAO NGAP Global Summit 2018. After lunch, we were guided to a large hall where the opening ceremony of the NGAP Global Summit would take place. The opening ceremony included welcoming remarks, announcements of a number of initiatives by various institutions including The Future Aircraft Designs Competition, and a number of signings between important training institutions and major companies including Airbus. After a coffee break, we got a chance to listen in to the first panel discussion of the event about how aviation is going to look like 20 years down the road. A panel discussion basically is a platform where 4 or 5 different speakers from different fields get a chance to present on their content related to the main topic of discussion, followed by a short discussion on what is presented, along with questions and answers. Personally, I found the initiatives taken to prevent UAVs from entering restricted airspaces by DJI rather interesting. For this bit, the representative from the International Federation of Air Traffic Controllers’ Associations (IFACTA) gave a number of opinions which highlighted the frustration of drones being a hazard to air traffic. The day’s events ended at about 5 in the evening, after which I decided to do a little bit of solo-exploring nearby the hotel. After a little bit of Googling, I found a shopping district/night market that I could visit which was 1-2 train subway stations away in Dongmen. There were a number of shopping and food options there (including China’s first McDonald’s) and I pretty much enjoyed myself. A selfie in the centre of Dongmen Pedestrian Street, Shenzhen, China. On Day 2, our shuttle bus left earlier at roughly 8am for the event location. Basically, Day 2 was dedicated to the model forum’s activities itself so it was going to be quite packed for the day. At the hotel itself, we were already separated to our different streams, and our workgroups met directly at our designated rooms at the guest house where we saw each other’s faces for the first time. The model forum functioned similarly to a competition. In each stream, there were four working groups with 10 members each of different fields and study. A surprise case study was given at the start of the day for the teams to work with. Every working group had only 3 hours to complete a solution to the case study. After which, the working groups had to present in front of a judging panel within a 15-minute time limit. The winning working group will get a chance to present the case study in front of a larger audience the following day where they will be judged for the best overall solution. It was quite a challenge. My group comprised of students from different nationalities including Germany, Hong Kong, Thailand, China, and Ghana, and are studying in different fields including Air Traffic Control, Aerospace Law, Aerospace Mechanics, and even International Trade. We only met for the first time and so we didn’t know one another’s strengths or weaknesses. In order to solve this, at the start of the discussion, we gave ourselves some time to digest the information from our given case study, gave brief introductions, and suggested how we personally could contribute to the team. My work group listing out facts of the case study on a whiteboard. Discussions could get pretty intense. Remember that we had to complete a presentation within 3 hours. We were cracking our heads on how we should approach this, and this is where our knowledge in different fields came into good use. Our case study was on the socio-economic effects of a new airport in Quito, Ecuador. For example, the pilots in our work group could relate to the implications of moving airline operations from one airport to the other, and the teammates who had knowledge in law and international trade could work out the implications in terms of law and economical benefits. We listed out the key information from the case study on a small whiteboard and connected the dots from there. For my work group, we split up the case study into different aspects of what we should cover and assigned them to pairs within the work group itself. That way, we could maximise our work efficiency. My notes used at the discussion. For my partner, June, and I, we had to research on the groups that are to benefit from having a new airport in Quito. On top of that, we had to evaluate how much of an impact the airports will have on these groups of people. Some of the examples include people who work in the agricultural sector as they would have better access to exports, and the residents in Quito who would face far less noise pollution as the old Quito airport was located in the centre of the city. Fortunately, we managed to use some useful examples from the initial case study package to back up our findings as well. At the end of the time we dedicated to research, we shared our findings with the other work group members and discussed on what information we should omit or include into the final presentation, and how they can inter-correlate with one another. By the time we started forming our presentation slides, there was very little time left before the actual judging started. Just a few minutes before, we were still frantically making final touch-ups to our presentation right outside the judging room. Our nominated presenters, Erik and Sandra, presenting our work group’s findings. For the judging process, our team was given only 15 minutes to present, and thanks to our 2 talented assigned presenters, Erik and Sandra, we pulled it off pretty well. The work groups were judged by 4 judges who were key people in the industry. After the presentation, there was a chance for a question and answer session which was probably the most stressful part of the judging process. It was during this time where people got a chance to clarify doubts or criticise some of the solutions that were presented by the different work groups. Our team was the first to present so afterwards, we got a chance to listen to what the other work groups got to come up with and I must say that some of them were pretty creative. I was also surprised that some teams had the time to come up with very detailed analyses of the case study. Despite our work group’s efforts, we didn’t manage to win the first round but it was quite a fun experience. And a tiring one. Even though we didn’t bring home any prizes, we did eventually collect a limited-edition ICAO pin which I, personally, was pretty excited about. The day ended a little later; about 6 in the evening. I wasn’t the kind of person to stay in my hotel so I went out with a couple of my newly-made friends from my work group and brought them to where I visited the day before; Dongmen Pedestrian Street. Of course, we had a little bit of fun having some of the street food, getting to know more about each other, and ended the day with a hearty Chinese meal nearby our hotel. Chinese dumplings and noodles for dinner. On the final day, the winning work groups from the respective streams had a chance at presenting in front of a larger audience. It was the first time getting to know findings from the other streams as well. While the judging process was meant to be set in a formal setting, some of the workgroups went creative with their presentations; even going to the extent of including some acting sketches. At the end, there was a photo-taking session and we broke off for lunch. For the second half the day, it was dedicated to the official closing ceremony for the NGAP where the winning stream work group was to be announced. For this year, the winning stream was the Unmanned Aerial Systems (UAS) and I’m happy to know that we had someone from Embry-Riddle to have contributed to the winning work group. The closing ceremony was a grand event with lights, music, prizes and everything. At the end of the ceremony, we had a chance to take a couple of photos to bring home as memories (or add to our CVs). Sandra and I had a golden opportunity to have a photo with the Secretary General of ICAO, Ms. Fang Liu. After the event, I spent my last few hours in Shenzhen exploring the city including visiting an art district and climbing a hill overlooking the city itself. A selfie from the top of Lianhuashan Park. It was quite an exhilarating experience. Not only did the forum open my eyes up more to the aviation industry as a whole, but it also gave me a chance to travel, work with people from different backgrounds, and also make new friends abroad (whom I still do keep in touch with). One final photo before we parted. Personally, if these opportunities were to become readily available to anyone, I really do encourage people to participate. Below, you’ll find my vlog during my time in the forum. My vlog during my time at the 2nd Model ICAO Forum in Shenzhen, China. Not only do such opportunities come rarely, but they are also extremely beneficial for you especially in the long run. Overall, I would like to thank the organisers involved, ICAO, Embry-Riddle, and finally, my friends and college mates who made all of this possible.